• If you are planting a new lawn, or over-seeding an existing lawn, use drought-resistant grasses. Many beautiful shrubs and plants thrive with far less watering than other species. Replace herbaceous perennial borders with native plants. Native plants will use less water and be more resistant to local plant diseases. Consider applying the principles of xeriscaping for a low-maintenance, drought resistant yard. 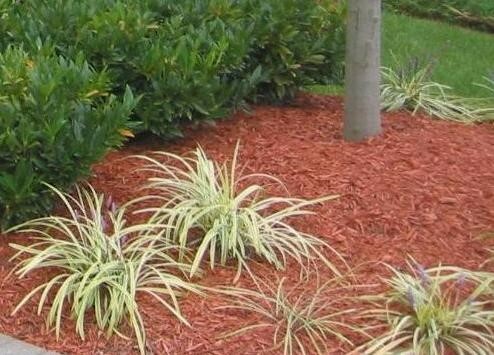 • Put a layer of mulch around trees and plants. Mulch will slow evaporation of moisture while discouraging weed growth. Adding 2-4 inches of organic material such as compost or bark mulch will increase the ability of the soil to retain moisture. • Position your sprinklers so water lands on the lawn or garden, not on paved areas. Also, avoid watering on windy days. • Water your lawn only when it needs it. A good way to see if your lawn needs watering is to step on the grass. If it springs back up when you move, it doesn't need water. If it stays flat, the lawn is ready for watering. Letting the grass grow taller (to 3") will also promote water retention in the soil. Most lawns only need about 1" of water each week. • Early morning is the best time to water the lawn because the air is cooler, and there's usually not much wind to blow the droplets. In the middle of the day, water evaporates too quickly. And in the evenings, water can cling to the blades of grass overnight, which can cause lawn diseases. • Add organic matter and use efficient watering systems for shrubs, flowerbeds and lawns. Adding organic material to your soil will help increase its absorption and water retention. Areas already planted can be 'top dressed' with compost or organic matter. You can greatly reduce the amount of water used for shrubs, beds and lawns by the strategic placement of soaker hoses, or by installing a simple drip-irrigation system. • Avoid over-watering plants and shrubs, as this can actually diminish plant health and cause yellowing of the leaves. When hand watering, use a variable spray nozzle for targeted watering.